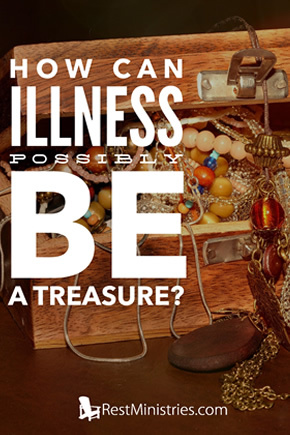 How Can Illness Possibly be a Treasure? Illness may leave you lacking in treasures but if you look closely, Angi shares how the blessings may surprise you. “I will give you hidden treasures, riches stored in secret places, so that you may know that I am the Lord, the God of Israel, who summons you by name” (Isaiah 45: 3). Hidden treasure is something that is concealed, unseen, and found in unexpected places. It is usually hidden in darkness and disguise, but once discovered you clutch it tight and don’t want to lose it. In Matthew, Chapter 6, we are told to store up treasures in heaven where neither moth nor rust can destroy. The Kingdom of Heaven is also referred to as the “hidden treasure” in Matthew, Chapter 13. As I thought about this verse, in reference to being chronically ill, it struck me that the “riches” could symbolize gold nuggets of truth that God teaches us through our “secret place” of pain. These gems are stored in heaven’s vault and cannot be taken from us. Born out of pain, loneliness, grief, and loss they can remain covered up, but when we dust them off we see their value and beauty. The lessons that we learn through the school of affliction should not be wasted. Jesus wants us to teach them to our children, encourage others, and comfort those with the same comfort we have received (2 Corinthians 1:3). I’ve learned that I would have no idea how to comfort the sick, if not for sickness. I would not know how to encourage the dismayed, if I’d not been in the pit myself. I would know nothing about comforting those in despair, if I’d not been there. Because through eyes of pain, I’ve witnessed God’s goodness and grace. Through need I have seen His provision. Through weakness I have learned strength. Through loss I have been given much. These gems are priceless, and through them we learn more about the Lord our God who calls us by name. “The law from Your mouth is more precious to me than thousands of pieces of silver and gold” (Psalm 119:72). Prayer: Father, give us eyes to see these gifts hidden under the veil of disease. Help us to see our affliction with a fresh perspective. Fill us with Your strength to press on. Keep our eyes fixed on You and things above, knowing that You often send blessings in disguise. In Jesus’ name, Amen. 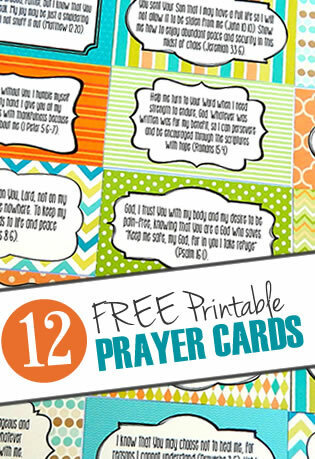 Angie Dugi lives in Texas with her husband and their three teenagers. For almost two decades she has struggled with Lupus, Sjogrens, fibromyalgia, and RA. She loves to write and delights in telling others about Jesus. She is the author of “What I Learned Lying Down: Hope for the Chronically ill” and “GodSmiles.” You can find her blog at www.mygodsmiles.net. What treasures have you discovered through your affliction? How have they changed your perspective? Filed Under: Coping Skills, Devotionals, Finding Purpose, Reflection, What's New? 5 Responses to How Can Illness Possibly be a Treasure? God has shown me that there are wonderful helpers all around me, people I’d have never met without my present needs. Also the treasures I have in God’s little ‘muses’, namely, my precious pets who are my helpers, they help to keep my mind off my difficulties. They are constant companions. Could I ask for prayer to find my little Iris, she is a sweet kitty who ran away from the place I rehomed her at, she is out in the winter cold. I saw her once, she was rehomed 10 miles away! I read it is nothing for a pet to go any distance for their owners, isn’t that AMAZING? ISN’T GOD AMAZING! Linda, I’m so glad that God has sent you helpers! I have met some my best friends because of this illness. And yes, I will pray that little Iris comes home! Bless you. I pray Iris returns as I truly know what comfort our fur babies bring to us. I pray for your comfort and healing. thank you for prayers for my Iris! I have one lady who is my age who has now helped me for 10 years, she is my best friend too….and I want to thank rest ministries for making signing in easier, hugs and kisses to you! I had the 17 hour brain surgery to remove an orange size meningioma, it is hard to have to sign in each time I come here, but you guys keep me afloat with the Word, and commentaries…………………………………..Feb. 14, it will be 10 years since surgery and miraculously, I have done ok.
Linda. It is a blessing to read your commentary about your struggles and triumphes. Please remember God never leaves us. Jesus is our best friend and greatest helper. Hold on in faith for all he plans for you. Blessings, Beth.